For as long as I can remember, Martin Sorrell has dominated the world in which I work. Right back when I started my career, as a graduate trainee for London PR agency Paragon Communications, Sorrell was the rock star CEO who graced the front pages of industry titles. We read in awe about his power breakfasts in London and New York, famously flying on Concorde between the two. He was always pictured in those huge, 80s-style black glasses that distinguished the Mad Men from the City types. When I switched to journalism in the late 90s, Sorrell continued to be the ultimate interviewee on industry issues. Increasingly his views were sought not only by specialist hacks like me, but also by the national media. He was to become a regular on Radio 4's Today programme. It wasn’t a recession until Sorrell called it as such, and decided if it were "V-shaped, W-shaped or bath-shaped". Ironically, Sorrell was the world’s most famous 'ad man' without ever really being an ad executive (he was a finance director by profession). At Saatchis in the 1980s he was the FD to Charles Saatchi's mercurial creative and Maurice Saatchi’s 'suit'. 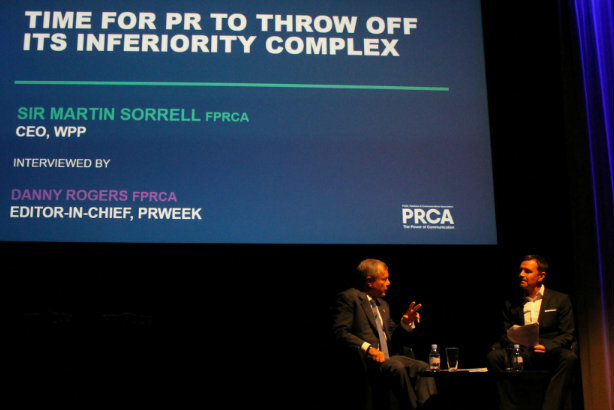 Equally, Sorrell was clearly one of the world’s most powerful players in PR, without ever being a PR adviser. Over the years I interviewed him live on stages in Farringdon and Piccadilly, at WPP’s head office in Mayfair, on film at the Cannes Festival, and in many other locations around the globe. It was always tricky to talk to Martin. Never boring. In 2015 he very kindly wrote the Foreword to my book 'Campaigns that Shook the World: the Evolution of Public Relations'. Over the years in the senior editorial roles I held at Campaign, PRWeek or Brand Republic, whenever we were planning editorial scenarios, the hypothetical story was: "Well, say Martin Sorrell suddenly resigns..."
Then, on Saturday he did. Let’s be clear, this isn’t an obituary. Sir Martin Sorrell is very much still around. He hasn’t even "retired". Much like Lord Bell, he told me many times that he never would. And let’s face it, his resignation statement on Saturday night was ambiguous ("Back to the future..."). But this does still feel like a tumultuous moment for advertising, PR, marketing and media; because, as I say, over the past quarter century he has personally dominated such sectors like no other. Hundreds of meetings I’ve had with ad bosses, PR gurus or fellow journalists have kicked off with the gambit "So what do you think about Martin Sorrell's", followed by "statement on...", "new strategy", "latest purchase of" or "enormous pay packet". When I was editor of Campaign I remember having lunch with one of his big agency bosses, who was physically shaking after losing one of their biggest clients. "I’ve just been on the phone to Martin," she quaked. "I promised him that I’d win all that business back within two years." Sure enough, she did. Equally, many people outside this industry regularly ask me: "What do you think of Martin Sorrell?’"
I have tended to answer "unique", which is probably the best adjective that can be applied to WPP’s boss for the past 33 years. Other accurate monikers would be: micro-manager, detail-obsessed, omnipotent, relentless, charismatic. "Is he nice?," someone asked me yesterday. God, that’s an adjective that feels completely inappropriate; one that Sorrell would hate. He doesn’t suffer fools. Or foolish questions. Or foolish statements. If ever one wrote an opinion piece criticising him, he’d be on the phone or email without hesitation, telling you in no certain terms what he thought. But journalists love that, because it means he reads your stuff, and he cares. And despite the popular caricatures, Martin can be charming, personable and thoughtful. On several occasions he has gone out of his way to share a kind word, lend a sympathetic ear, even meet for a personal chat on a Saturday morning. He could also listen. But this is a businessman with such a sharp mind that he could listen and talk simultaneously (while also checking his phone, buying another agency and so on). He had that Brian Clough approach to debates - "We talk for about 20 minutes and then we decide I was right." So, amid all the rumours around the reasons for his departure, the predictions of the imminent break-up of the 200,000-people empire he has built, PRWeek’s forthcoming analysis of what will happen to WPP’s massive PR interests - on a personal note this seems a slightly melancholy time, because the biggest beast in media and marketing jungle has suddenly been slain.